Obama's labor board failed to protect union salts. Now union busters can go back on the attack. 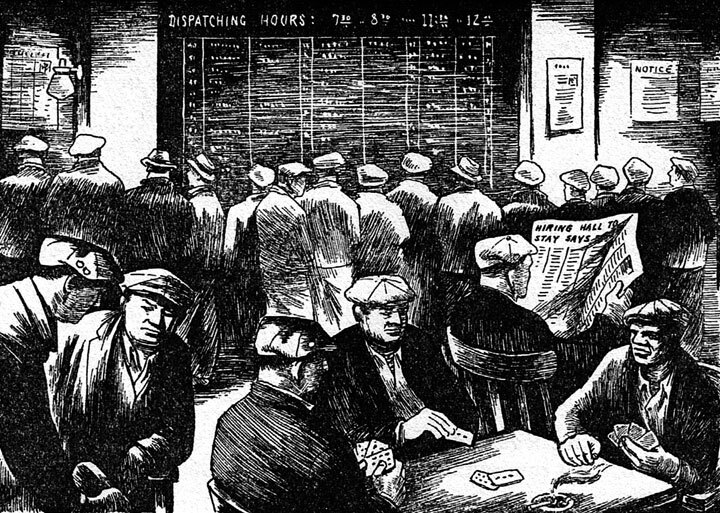 "The Hiring Hall," Bits Hayden, 1934. Attacks on the American labor movement have often been swift, dramatic, even violent. The 1947 Taft-Hartley Act was such a widespread attack on labor rights that unionists called it the “slave labor bill.” Reagan’s firing of more than eleven thousand striking air traffic controllers shocked and undermined the entire labor movement. Striking workers were repeatedly killed by federal troops, state militias, local law enforcement, and private guards from the late nineteenth century through the 1930s. Other attacks on labor have been more nuanced and subtle, but not necessarily less destructive. Labor’s power to effectively strike was eviscerated piece-by-piece by federal court decisions and decisions of the National Labor Relations Board (NLRB) that gradually banned or removed legal protections for various kinds of strikes. Union busters have chosen this approach to target “salting,” and these attacks may resume under President Trump. Salting is a union organizing tactic in which an organizer (a “salt”) applies for a job at a nonunion company with the goal of organizing his or her coworkers to form a union, recently explored in detail by Erik Forman. The history of salting in the United States goes back at least to the founding of construction unions in the late 1800s, and unions have utilized the tactic in numerous industries throughout the twentieth century. In Steve Early’s 2013 book Save Our Unions: Dispatches from a Movement in Distress, one chapter tells the stories of salts involved in modern campaigns to organize hotel workers, Starbucks baristas, bicycle messengers, and others. Early concludes that the inside experience provides salts “invaluable” lessons they can put to use if they move on to other roles in the labor movement. In addition, the insider role provides numerous benefits for the organizing campaign at hand. Rather than acting in an outside capacity, salts gain additional credibility as they earn the trust of their coworkers and can more fully understand and effectively agitate around the concerns that are unique to a particular workplace. While providing its practitioners with lessons in how labor organizing works, salting is also an effective tool for unions. This is why historically, the tactic has often come under attack by capital and the Right — and why it may soon come under attack in the Trump era. Under the Supreme Court’s 1995 decision NLRB v. Town & Country Electric, salts are entitled to all of the various legal protections of the National Labor Relations Act. This means that it is illegal for companies to fire, refuse to hire, or otherwise discriminate against a salt because of their union affiliation or union activities. After Town & Country Electric, the NLRB developed legal standards for determining whether a company illegally refused to hire a salt. Initially, the salt must prove that the company was hiring, that the salt was qualified for the position, and that the salt’s union affiliation contributed to the company’s decision not to hire the salt. The company can then defend itself by demonstrating that it had a legitimate reason for not hiring the salt. If it cannot do that, the board will find that the company unlawfully discriminated. Once the NLRB determined that a company unlawfully discriminated, either by refusing to hire a salt or by firing a salt, the typical remedy was to order the company to offer employment to the salt and to provide the salt with back pay. The board assumed that the salt should receive back pay for the entire time period from the date the company discriminated against the salt until the date the company extended a valid offer of employment to them, unless the company provided evidence that the salt would not have continued working for the company for the entire period. In 2007, the Republican-controlled NLRB issued a pair of decisions that made it easier for companies to get away with discriminating against salts or, for companies unable to get completely off the hook despite the newly favorable legal standards, to reduce the financial penalty imposed for their discrimination. First, the board decided Oil Capitol Sheet Metal in May 2007. In this case, the NLRB changed the rules for determining the amount of back pay to award to a salt who was the victim of unlawful discrimination. Not satisfied with merely softening the penalties for companies that discriminate, the board went further four months later in Toering Electric Company by requiring salts to jump through more hoops to establish that the company violated the law. This means that even if it is undisputed that a company refused to hire a salt because of the salt’s union affiliation, which is unquestionably illegal under Town & Country Electric, the salt must prove to the board’s satisfaction that he or she “genuinely” wanted the job — whatever that means. If the salt cannot do so, the board ignores the discrimination and the company is off the hook for its otherwise illegal actions. Oil Capitol and Toering Electric constitute a significant danger to unions’ rights to engage in organizing activities. The evidence in unfair labor practice cases is frequently ambiguous, often depending on a judge’s interpretation of witness credibility. Inquiries into an individual’s mental state, such as whether a salt “genuinely” wanted a job, are even more fraught with uncertainty. NLRB offices are protective of their limited resources, so this additional opportunity for companies to introduce uncertainty is potentially a significant hurdle for a union to clear in its effort to convince the NLRB to prosecute a charge. The placement of the burden of proof in these cases is hugely consequential — if the evidence is unclear, the party with the burden will lose. When a company discriminates against a union organizer, it makes no sense to give the company the benefit of the doubt and place the burden of proof on the union. But this is exactly what the NLRB now does. These cases have been the Right’s most successful attack on salting, but they have also pursued other methods. Republican legislators have introduced a bill called the Truth in Employment Act, which would allow companies to fire or refuse to hire salts under an even more lenient legal standard, in every congressional session since Town & Country Electric was decided in 1995. Republican-led congressional committees have also held numerous hearings on the subject over the years, typically with obnoxious titles such as “Examining Union ‘Salting’ Abuses and Organizing Tactics That Harm the US Economy.” At these hearings, the committees have predictably solicited testimony from business owners about how they have been “victimized” by salting campaigns. In one instance, a House committee heard testimony from the owner of an upstate New York electrical contracting company who had, according to an NLRB judge’s decision issued only eleven days prior to the hearing, illegally interrogated, threatened, and fired union supporters who worked for him. But these tactics had no real way forward following Obama’s election in 2008. The NLRB faced serious obstacles during Obama’s presidency, most prominently with the Supreme Court vacating years of the board’s decisions as a result of congressional Republicans refusing to approve Obama’s nominees to the board. On the whole, however, the Obama-era NLRB made improvements to the labor law landscape. As a result of the board’s 2011 decision Specialty Healthcare, smaller groups of employees who want to form a union for themselves, such as the members of a particular department, are now more easily able to organize on their own without needing to organize other groups of coworkers as well. In 2015, the NLRB implemented new election rules with modernized procedures that have led to faster union representation elections. The board also overturned decisions by the Bush-era board that had changed existing law governing issues like decertification elections and joint employers in ways that favored bosses. In the early days of the Obama administration, union-busters feared that the Bush board’s salting decisions would also be on the Obama board’s chopping block. This fear ended up being unfounded. Inexplicably, the Obama NLRB denied union requests to reconsider the Bush board’s decisions, stating that it was “not prepared at this time to deviate from precedent” and continued to apply the new anti-salt standards. The Obama board’s confounding course of action makes the status of this particular battle especially frustrating. Labor has certainly suffered more consequential defeats in recent years, including the continued expansion of right-to-work laws, the rollback of collective bargaining rights for state employees, and the failure of efforts for federal card check legislation. Many of these defeats, however, have resulted in large part from state-level political conditions that will be extraordinarily difficult to overcome in the near future. Failing to restore the board’s previous salting rules, on the other hand, was an entirely unforced error. With Trump in the White House, Republican control of the House and Senate, and an open seat on the Supreme Court to fill, the Right can now get to work targeting labor. Notorious racist Steve King has reintroduced the Truth in Employment Act for the new legislative session, along with other anti-labor bills, such as the National Right to Work Act and a bill to repeal the Davis-Bacon Act, which keeps wages high for government subcontracting workers. Some commenters have suggested that focusing on these bills would be a “trap,” noting the unlikelihood of their passage. While this may be true, legislation is only one of the Right’s potential paths. Once Trump makes his NLRB appointments and they receive Senate approval, the Republican majority on the board could continue to chip away at protections for salts or further soften penalties for companies that discriminate against them. And after Scalia’s seat is filled and the Supreme Court prohibits agency fees in the inevitable successor case to Friedrichs v. California Teacher Association, anti-union groups could pursue additional cases to thwart union and worker rights. The chaotic first months of the Trump administration have provided the labor movement with little clarity as to what to expect in the coming years. Unions and workers will surely face a variety of attacks, and we will need to act as dependable allies for other social movements and oppressed groups as well. We will need to make intelligent decisions about how to focus our time and resources in the struggle against Trump. But it is clear that we need to be prepared for anything — Trump has shown that nothing is off the table. Salting will not be the first target of the union-busters, but the attacks on salting over the last twenty years make clear that it is on their hit list. Nick Johnson is a union lawyer in New York City. Obama’s labor board failed to protect union salts. Now union busters can go back on the attack.